Taking Part? Research Cluster is one of the three clusters supporting the Third Sector Research Centre. 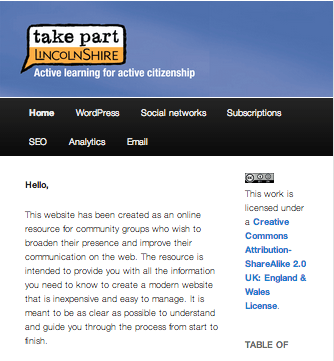 Take Part is one of the partners in the research process of the Take Part Research Cluster. This book explores the contemporary approaches to democratic citizenship and community-based education. It provides a series of case studies and reflects on the lessons of national and global initiatives. The Take Part Pathfinders Programme aimed to support community leadership and active citizenship education. The Take Part pathfinder programme was evaluated on behalf of the Department of Communities and Local Government. A range of evaluation tools were developed to assist pathfinders and regional champions to self evaluate and workshops on evaluation were carried out across the country. Over 1,000 people took part in training to understand how they could influence decisions in their local communities and national policy making. This was through the Train the Take Part Trainers project, aimed at building the confidence, skills, and knowledge of individuals, so they could feel competent to take on an active role in their communities. The project was delivered by the WEA in partnership with the National Association for Voluntary and Community Action (NAVCA). The project represents one strand of the Take Part National Support Programme which was funded by the Department for Communities and Local Government (DCLG) and managed by the Community Development Foundation (CDF) and the WEA acknowledges the support and contributions made by colleagues at CDF and DCLG to the Train the Take Part Trainers project. This website has been created as an online resource for community groups who wish to broaden their presence and improve their communication on the web. The resource is intended to provide you with all the information you need to know to create a modern website that is inexpensive and easy to manage. It is meant to be as clear as possible to understand and guide you through the process from start to finish.